The City of Toronto is developing a new Parks Plan and is seeking public input. The closest public meeting for South Etobicoke is Thursday, December 1, at Amesbury Community Centre, 1507 Lawrence Ave. W. (Apparently there is an effort to get another meeting closer to this part of the city.) In the meantime, you can take the online survey. They say it should take no more than 15 minutes to complete, but there is a section that asks you to select from a list, the parks you have visited in the past year. It is a huge (alphabetical) list, so if you’re a heavy park user, or just someone who visits places like “Rotary Park”, you will have lots of scrolling and selecting to do. The survey reflects those principles in questions around the importance people place on various park services, ammenities and attributes. Taking the survey should be a worthwhile exercise for anyone concerned about our parks and their future. Note: the online survey will be ending on December 16th. Do it today! Click here to read the Staff Report. The TRCA have just published a new Fall 2011, Mimico Waterfront Park Community Newsletter, on their website. It outlines the contruction plan for the next few months and still lists completion as the fall of next year. You can find out more about the park and it’s history on our Mimico Linear Park page. Another of the Park Lawn Road condo developments is coming up for a public meeting on November 8th. The OMB have already approved high densities on all these sites, but CCFEW’s main concern is the creek and ensuring that a trail system is built in the creek valley. The proposed development is a mixed use project consisting of a 41 storey residential building containing 345 dwelling units and a separate 2 storey commercial building adjacent to Park Lawn Road. Access to the site will be from an internal road connecting to a new signalized intersection at 10 Park Lawn Road to the south. A total of 325 parking spaces in four levels of underground parking are proposed with visitor parking both on the surface and in the underground garage structure. Click here for the official meeting notice. The 51 Lakeshore Drive saga is apparently over (for now). Dunpar Developments have withdrawn their OMB application to redevelop the site. Sherway Trail Update: We have been pushing for months to determine exactly what is holding up approvals for the Sherway Trail extension. Our efforts to arrange a meeting with MTO have been unsuccessful, but A letter from the Etobicoke-Mimico Creeks Watershed Coalition (of which CCFEW is a member) did receive a response. The permit to extend the trail under the QEW is on hold pending decisions around widening the QEW in that area. On July 4, work will finally begin on Phase 2 of the Mimico Linear Park. Today the TRCA officially acquired the final piece of shoreline to allow completion of the long-awaited park. The construction entrance will be at Superior Ave. The first phase of construction will be building the armourstone shoreline. Once that is complete, they will fill the area between the existing shoreline and the armourstone. The plan calls for the existing gazebo near Grand Harbour to be moved further into the lake and the public area around it to be enlarged. The area will be closed to the public when work on this section begins later this summer. Reconfiguring this area is intended to improve traffic flow and reduce pedestrian/cyclist collisions. Accommodating the diverse needs of trail users and reducing collisions was the hot topic of this evening’s public meeting. The waterfront parks are victims of their popularity: there’s no escaping trail congestion on the busy summer weekends. There’s not enough real estate to give all visitors as much room as they might like on busy days. To learn more about the park and its history visit our Mimico Linear Park page. Starting this week, construction of the master plan at Marie Curtis Park West will begin. Construction vehicles will use the existing park road, however access to the park will remain open. This first stage of construction will include the permanent closure, removal and restoration of the southwest parking lot. The southeast parking lot will remain open and access to it will be maintained during construction activities. In the interest of public safety, the construction site will be restricted to authorized personnel only and will remain closed to public access until construction is completed. The Waterfront Trail will remain open throughout the construction. You can view the revitalization plans on our Marie Curtis Park page. On Monday, there was a public meeting to discuss the latest redevelopment proposal for 11 Superior Avenue (The corner of Superior and Lake Shore Blvd. W.). We weren’t at the meeting (it coincided with our Annual General Meeting), but from what we’ve seen it appears to generally reflect the vision of the Mimico 20/20 process. 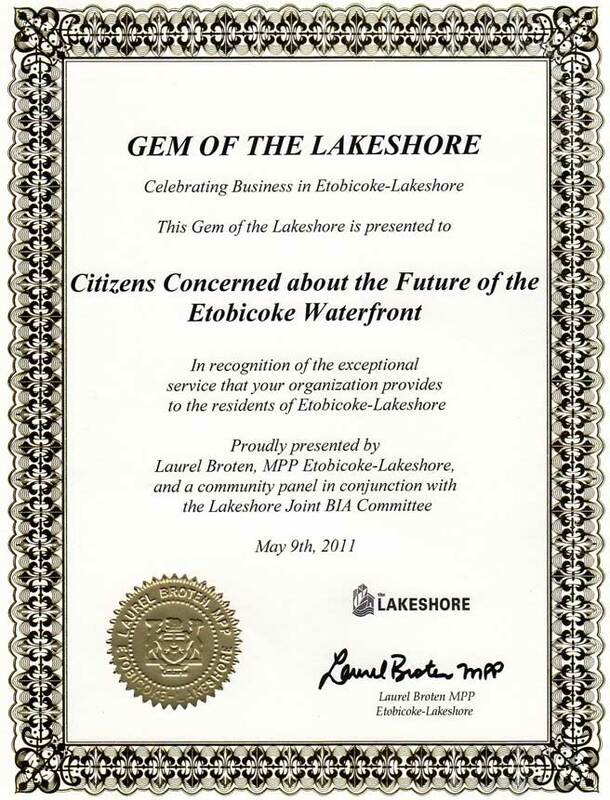 On Monday, in addition to having our Annual General Meeting, CCFEW was honoured as a “Gem of the Lakeshore”! CCFEW’s April Newsletter is now available on-line. The newsletter was mailed to members last month. You can read it here. To get your own (electronic or hard) copy a bit earlier, consider becoming a member. You’ll also be helping cover the cost of our work! (We are 100% volunteers, but it still need to spend money on printing, postage, and maintaining this website. LEAF is a not-for-profit organization dedicated to the protection and improvement of the urban forest. Since 1996, LEAF has helped citizens plant over 16,000 native trees and shrubs in their neighbourhoods. 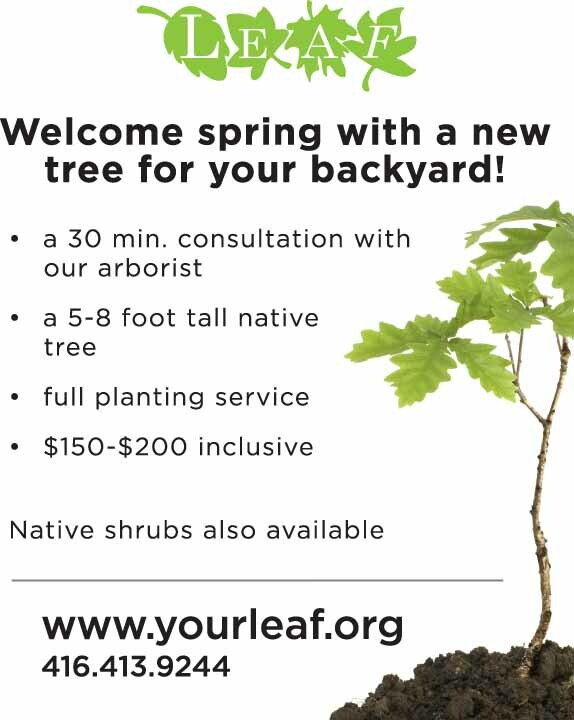 Their Backyard Tree Planting Program offers native trees and shrubs to homeowners at a subsidized cost through the contribution of their supporting partners. Their certified arborists will help you make an educated decision about the type of tree that best suits your property, and where it should be planted. Native shrubs are available for $25. and will continue through to Saturday morning. temperature can lead to very hazardous conditions close to any water body. This High Water Safety Bulletin will be in effect through Sunday, March 13, 2011. For more information please contact the on-call Flood Duty Officer at 416.661.6514. Plans for Inspiration Lakeview will be presented this week. These are the plans for the waterfront immediately west of Marie Curtis Park. There were several complaints at the meeting in November, discussing proposed enhancements to Marie Curtis Park that we weren’t seeing what was planned for the Arsenal Lands next door. Although a master plan was developed and approved several years ago, the scope of those plans has increased through the Inspiration Lakeview process. Creek Time, the newsletter for the Etobicoke Mimico Creeks Watershed Coalition has gone electronic! Click on the image below to check it out. Not sure exactly when it happened, but Google Maps now gives directions in Toronto for TTC, cycling, and walking. The public transit option has been there for a while, but it finally works in Toronto! Have you ever wondered why wetlands are important? Have you ever wanted to explain it to someone else? 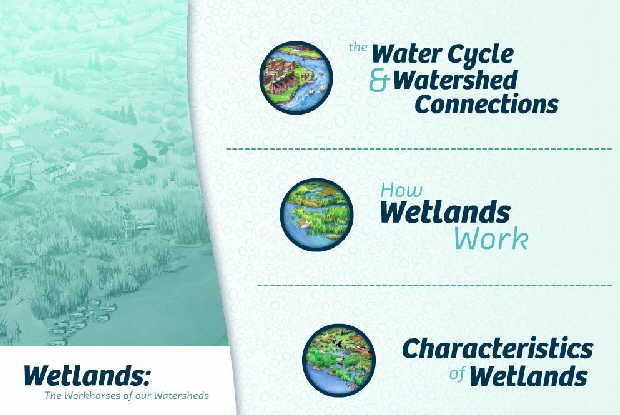 Do you want to learn more about wetlands and the water cycle in a clear, easy to understand format? Conservation Ontario has a great series of graphics and animation on all of these subjects on line. Click on the image below to start learning! City Planning is pleased to announce the return of Urban Strategies Inc. to complete the final "vision-to-implementation" phase of the Mimico 20/20 Project. As many of you now know, Urban Strategies is an award winning Toronto based, internationally respected planning and urban design firm that has once again assembled an impressive multi-disciplinary team to complete this latest critical task. You are invited to explore some more of Urban Strategies' work here. You can also find background on this project on our site here.